The best way we can honor and show respect to Rumi is not to pigeonhole him into any one region or religion just to make some contemporary political case but showcase him as an example of how high we can rise. 2018 will mark my 30th year of sharing my love of Rumi with the world. I began exploring my deep connection to Rumi, in New York, back in 1988 when I was in my early twenties. Rending The Veil: Literal and Poetic Translations of Rumi is the book that stands out from a few I’ve done so far. Rending The Veil’s structure is completely unique in history of Rumi. It brings to the Western reader 252 poems of Rumi, many of which never before translated, and present each of them in 4 versions. The actual calligraphic Persian of the original, a transliteration, word-for-word translation and finally a true to source English rendition. Rending The Veil was published 22 years ago by Hohm Press and it’s a recipient of Benjamin Franklin Award. I remember a very rude Iranian radio interviewer once asking me, “why would a Jew, wanna translate Rumi?” Frankly I just laughed at her sheer ignorance of who Rumi is and what Rumi represents. The interview was pre-recorded for a major network from Europe and that silly line didn’t make the final edit. The fact that a “Jew” has devoted decades of his life to Rumi is indeed the whole story of Rumi’s appeal to Western audiences in a nutshell. I am a living example of Rumi’s universality and his timeless message of self-empowerment, lack of prejudice and finding the divine not at any place of worship but in your own heart. Rumi is a creative giant with a very colorful life story that involves a wild anti-social mystic mentor and an honor killing. Rumi was also extremely prolific; he left behind about 70,000 verses of poetry almost all in Persian that are collected in two epic books. The first collection is devoted to his mentor Shams. It took him 15 years to complete this collection and it’s one of all-time best communications from a mystical giant to other mystics and students of high-octane spirituality. Yes, the first collection is not understood by the public in the East and is almost always ignored. In fact if Rumi hadn’t worked on his lighter second work, he wouldn’t have become so popular in the East. After the first collection, he devotes the last ten years of his life to creating a populist work. A work filled with anecdotes, life lessons, moral stories, stories from all three Abrahamic religions, popular topics of the day and even satirical tales. And needless to say he is known today in the East for this body of work and not for his massively brilliant, game-changing mystical expression of his first volume. His first volume contains roughly 35,000 verses and it is called the collective poems of Shams from the city of Tabriz. Shams was a powerful spiritual figure who was a maverick mystic (not belonging to any sect) and he considered himself a Persian mystic. Shams followed the wayfarer tradition of Persian mystics, who were worldly renunciants. He owned nothing, lived no place and dressed following the code of Persian dervishes of that school, wrapped in a felt fabric carrying a small metal ax and a metal bowl. The focus on my work with Rumi has always been the first collection. I have never been even slightly interested in his populist work (called Masnavi or Mathnawi). In fact, I learned and memorized a Rumi poem from the second collection in 3rd grade in Iran, a story about Moses and a shepherd–so Masnavi can even resonate with a ten-year old. However, to a fully-committed mystic these pop tales have little value. We want heat, fire, burning, depth, high-grade wisdom and we want communication that is out of the mainstream noise. We want mystic-to-mystic talk in code and the first collection delivers that in spades. In my work I offer translations of Rumi in all 3 forms: direct, literal and poetic renditions. However, since almost all other books on Rumi are written by those with no knowledge of Persian, they are poetic renditions a generation or two removed from the original. Often times they are renditions on renditions. Or are by Turkish writers who translate Rumi into English from Turkish translations. So, it’s understandable why some Persians complain that lots of English poems of Rumi don’t resemble what Rumi says in Persian. Ultimately the readers decide which version they prefer. And not many readers want authentic, they want something they can relate to and renditions offer that the best. Here’s a bit of very relevant history lesson. In early to mid part of 20th Century another Persian poet become a superstar in the US. In fact at that time he was many times more known and popular than Rumi is today. He was so popular that he was being mentioned or featured in mainstream major studio movies routinely and there is also a biopic of him from Paramount studios in 1957. His name: Omar Khayyam. Khayyam’s popularity wasn’t because of direct or even literal translations of his work, it was because of a very clever English poet, Edward FitzGerald, who rewrote Khayyam in English to suit the popular literary taste of the time. There are certain historical personalities that transcend their race, color of skin or religions they’re born into and become internationally recognized stars and break barriers. Nusrat Fateh Ali Khan, Bruce Lee and Miles Davis are among such personalities. Miles is one of my all time heroes and inspirations. I was thinking about Miles before writing this article today that I’ve never, in my mind, marginalized him into any demographics. Miles Davis to me represents a high caliber mystic, his weapon of choice trumpet. He is a universal expression of yearning and wisdom and he is in many ways timeless and placeless. Rumi is also timeless and placeless. 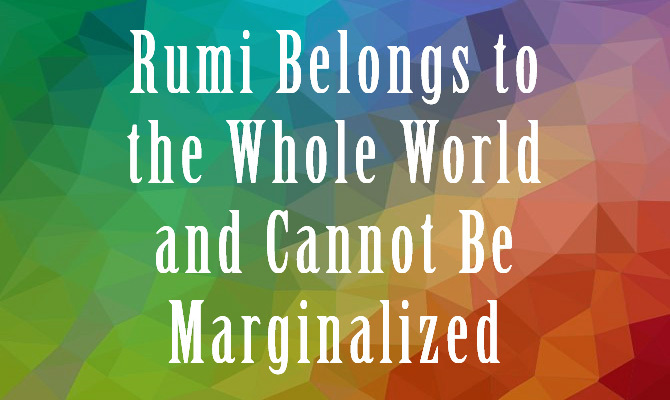 The world has embraced Rumi not because of where he was born or where he grew up or what religion he belonged to but because of what he represents. Rumi is a high-caliber universal force and to narrow him down and pin him to any one place or one faith is utterly criminal. Don’t even try to bring Rumi down to your level. Instead see if you can rise to his. Rumi is a giant on our planet; in fact he is unfathomable. My love and admiration for him has no bounds. The best way we can honor and show respect to him is not to pigeonhole him into any one region or religion just to make some contemporary political case but showcase him as an example of how high we can rise. Rumi is untouchable by mere mortals, stop attempting to marginalize him.